Texans would love to be able to lay claim to having originated fajitas, but the honor goes to the south-of-the-border vaqueros who learned to make good use of a tough and membranous cut of beef known as skirt steak. Before fajitas became popular throughout the US, skirt steak was a cheap cut scorned by all but the most dedicated beef eaters. Since then, however, the price of skirt steak has doubled and redoubled. The Mexican term for grilled skirt steak is arracheras, and its American counterpart is fajitas. Therefore, the term "chicken fajitas" is truly nonsensical, although we are not such purists that we don't include a recipe for a Chicken Fajita Marinade. But these days, fajita has come to describe just about anything cooked and eaten, rolled up, in a flour tortilla. The only true fajitas, however, are made from skirt steak. Any discussion of fajitas must take into consideration not only tortillas, but pico de gallo and guacamole. Fajitas start with the marinade. Marinades for beef fajitas rely on acid ingredients like lime juice not just for flavor, but to tenderize the meat. So that the marinade will have time to work, beef fajitas should be marinated several hours or up to 24 hours. We have three beef fajita marinades and one chicken fajita marinade, some of which contain dried or fresh chiles as a heat source. There is nothing written in stone when it comes to marinades. Cooks experiment with everything from bottled salad dressing or orange juice to tequila or Coca-Cola. Putting together your marinade can be a creative experience. This is the traditional method of preparation for fajitas. When the coals are ready, drain the marinade from the meat and cook it about 3 inches above the coals for approximately 6 minutes on each side, for skirt steaks between 1 and 1-½ pounds. When the meat is cooked to your liking, remove it from the grill and let it rest for 5 or 10 minutes. Cut it across the grain and diagonally into finger-length strips. Cold and wet weather can make outdoor grilling impractical. No matter. If you get a taste for fajitas and don't want to go outside, you can cook them in your broiler. Broil the meat about 4 inches below the broiler flame for 5 to 6 minutes per side; then let the meat rest and slice as for grilled fajitas. Drain the meat; then cut it across the grain, diagonally, into finger-length strips. Fry the strips over high heat in a large cast iron skillet or wok, working in batches if necessary, turning them frequently. They should take no more than 1-½ to 2 minutes to cook. I like to fry fajitas because I wouldn't think of serving them without stir-fried onions and bell peppers, so my skillet does double duty. By now, of course, everybody knows how to eat fajitas: You roll them in a flour tortilla -- but not all by themselves. The proper fajita feast will include a stack of warm flour tortillas, grilled or fried onions and bell peppers (red and/or green), pico de gallo, guacamole and maybe a little sour cream. The onions and peppers are very simple: Heat your frying pan or wok and add a few tablespoons of olive oil. Add 1 large (or 2 medium) onions, separated into rings, and 2 green bell peppers (or 1 green and 1 red), cut into strips. When the oil is heated, add the onion rings and pepper strips and stir-fry them just until they start to get limp, 3 or 4 minutes. You might sprinkle just a little salt over them while you stir-fry. When they are ready, remove them from the pan and keep them warm. Fairly good to excellent flour tortillas are available in supermarkets almost everywhere these days. If you have a choice, select the thickest ones you can find, 6 or 7 inches in diameter. Warm them up by sealing them in foil packages, six or eight at a time, and placing them in a 325°F oven for about 20 minutes. Wrap them in a cloth napkin to bring them to the table. Better yet, use one of those nifty tortilla keepers. Two recipes for this specialized fajita salsa are included below. The literal translation of pico de gallo (pronounced PEEK-o de GAH-o) is rooster's beak, but why this fiery and flavorful salsa should be so named is a mystery. Pico de gallo shares many of the same ingredients found in other salsas, but the principal difference is that the ingredients are very finely chopped. Properly made, pico is hot, no two ways about it. But since people put their own fajitas together, they can control the heat, if they must, by limiting the amount of pico de gallo. The cool, buttery smoothness of guacamole puts the finishing touch on a fajita. Again, guacamole is a dish with millions of fans, but there are many variations. Experiment until you get yours just right. We include a basic recipe with suggested variations. It is not possible to make good guacamole from bad avocados and, sadly, good avocados are not always obtainable at the supermarket. Look long and hard to find the Haas variety (they have a brownish-black skin with a pebbly texture), and it's okay to buy them rock hard if you won't be using them right away. Avocados will ripen best at room temperature and, if you're in a big hurry, put them in a paper bag. Once they are soft and yielding to the touch, they are ready to be used. Fajitas are a terrific entr&#eacute;e for an informal dinner party. There is something inherently festive about them and their accompanying dishes. Or perhaps it's the margaritas and Mexican beer that so often go hand-in-hand with this Tex-Mex treat. Whatever. Don't settle for some watered-down, chain restaurant version of fajitas. 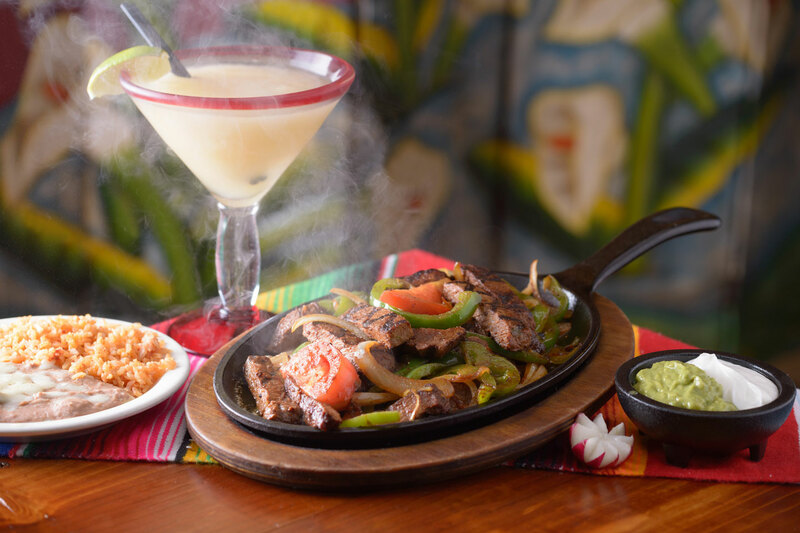 Experience the fajitas you make yourself, and all that goes with them.